While the media is considered essential in the functioning of democracy, there is a temptation for incumbent governments to use media outlets to deliver political propaganda. This propaganda can be used by the government, among other ways, to promote its policies, to increase its standing with the population in advance of elections, and to criticise opposition leaders and parties. For example, Adena et al. (2015) document the importance of political propaganda in mobilising support for the Nazis, and Yanagizawa (2014) provides evidence on the role of propaganda broadcast via radio by the Hutu government during the Rwandan genocide. In democracies, government propaganda, if influential, may lead to moral hazard via poor monitoring of incumbents by voters, and the re-election of low-quality politicians and parties. Sophisticated consumers of information may respond to such propaganda in a variety of ways. In addition to discounting biased information (Chiang and Knight 2011), viewers may simply switch to other media outlets that are not delivering government propaganda. With a preference for like-minded information, this switching is particularly relevant for consumers affiliated with the opposition. Note that switching will only be available in media sectors that are pluralistic – those offering a variety of ideological viewpoints. Given this, another possibility involves consumers simply ‘tuning out’, or consuming less information overall across all media outlets. Like switching, tuning out may be especially relevant for the opposition. By their very nature, switching and tuning out can limit the influence of propaganda. Given that, as noted above, both switching and tuning out may be especially common among the opposition, then propaganda, if influential, may lead to an increased polarisation of the electorate. Likewise, we examine whether or not switching and tuning out are more common among individuals with a larger choice set. If so, and given that higher-income individuals typically have larger choice sets, polarisation according to income may also increase, with the poor disproportionately exposed to and influenced by propaganda. While Durante and Knight (2011) investigate switching over several years, we investigate these issues, both switching and tuning out, using high-frequency television ratings data from the country of Venezuela. In this country, Hugo Chavez and his successor have routinely used cadenas – speeches by government officials that are required to be aired live by all broadcast television channels. Thus, during a cadena, viewers watching television face the same programming on every broadcast channel. Importantly, these cadenas are not announced in advance to viewers, providing an experiment through which to examine short-run responses to government propaganda, in terms of changes in viewership. In addition, cadenas were not required to be aired by cable channels during our sample period, allowing us to examine whether households with larger choice sets are more likely to switch to other outlets when faced with propaganda. Importantly, broadcast television in Venezuela during our sample period covers the political spectrum, and channels can be naturally categorised as opposition, balanced, or public/pro-government according to their content. 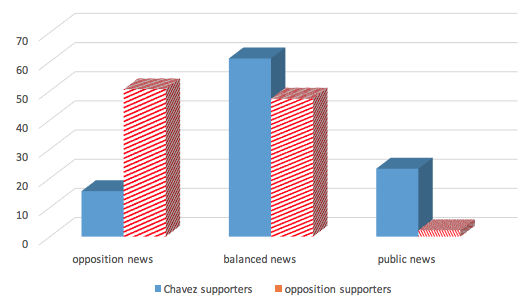 Moreover, we show in Figure 1 using survey data from Latin American Public Opinion Project, that Chavez supporters disproportionately watch public (pro-government) news and the supporters of Rosales, the opposition candidate in 2006, disproportionately watch opposition news. This allows us to examine whether switching and tuning out are more common among opposition viewers via an examination of viewer responses to cadenas on different channels. To develop a set of testable hypotheses, we begin by building a simple model of consumer choice of television programming. In the model, there are two types of consumers - opposition and pro-government - both with a preference for like-minded information; two types of channels - opposition and government; and two types of programming - news and cadenas. We begin by assuming that both channels are required to air cadenas and thus initially focus on tuning out. The model predicts that, with positive switching costs and a preference for like-minded news, the drop-off in viewership when transitioning from news to cadena is more significant for the opposition channel than for the pro-government channel. This is due to the selection of opposition viewers into news programming on the opposition channel and the selection of pro-government viewers into news programming on the government channel. Introducing a third channel, which is moderate in nature, the model predicts that the drop-off in ratings when moving from news programming to cadenas should be most significant for the opposition channel, followed by the moderate channel, and then followed by the government channel. Finally, we consider an extension of the model to allow for switching via a cable channel that is not required to air cadenas, and this extension provides two additional predictions. First, the model predicts that the drop-off in viewership on the private network, relative to the public network, should be more significant for households with access to cable than households without cable. Second, cable viewership, due to its role as an outside option, should be higher during the airing of cadenas on broadcast channels, relative to when cadenas are not aired on broadcast channels. We then test these predictions using data on television ratings from Venezuela. These data cover the years 2006 and 2007 and are high-frequency in nature (i.e. day-by-day and show-by-show). Consistent with the first prediction of the model, we find that the drop-off in viewership when transitioning from news programming to cadenas is more significant for the opposition channel than for the government channel. Consistent with the second prediction of the model, we find that the drop-off in viewership for news programming on the moderate channel takes an intermediate value, between that of opposition channels and that of government channels. 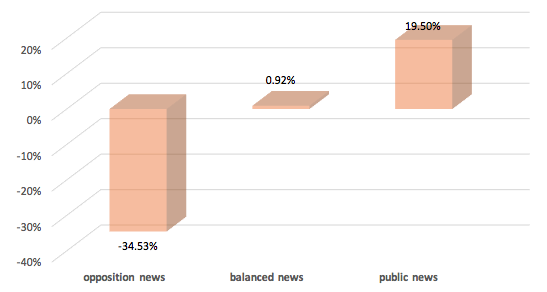 In particular, as shown in Figure 2, while there is little change in viewership when transitioning from news to cadenas on balanced channels, there is an increase on the public channel and a sharp decrease on opposition channels. Next, focusing on the outside option, we find that, consistent with switching, cable viewership rises during cadenas and the drop-off in viewership is more significant for those with access to cable. Complementing this analysis, we also estimate the underlying structural parameters of the model; these include switching costs and the value of ideological information. Using these parameter estimates, we document the dynamic viewer responses to cadenas, which lead, for example, to a persistent reduction in viewership among opposition viewers watching opposition channels. We also use the parameter estimates to conduct a normative analysis in which we document substantial welfare benefits of media pluralism via a broadening of the ideological spectrum. This analysis has implications for political polarisation. To the extent that discounting of biased information by viewers is incomplete and propaganda is thus influential, our results suggest that viewer responses, as documented here, may lead to increased political polarisation. This polarisation may increase according to ideology, with pro-government viewers disproportionately exposed to propaganda, and according to income due to the fact that high-income viewers are more likely to have access to cable channels that were not required to air cadenas. Chiang, C-F, and B Knight (2011), "Media bias and influence: Evidence from newspaper endorsements", The Review of Economic Studies: 795-820.